I admit that I have an unhealthy obsession with cookbooks and food magazines. One of my favourite magazines is one published in the Philippines called Yummy. I’ve been a long time reader and used to always ask my Mom to buy them and bring me copies when she would visit. I was thrilled when last year I found out they were also on Zinio which meant I could read them as soon as they were published online. Imagine my excitement when Liz, one of their assistant editors, asked if I would be interested to be featured as a guest chef – uhm… hello?!? Of course I would be honoured! 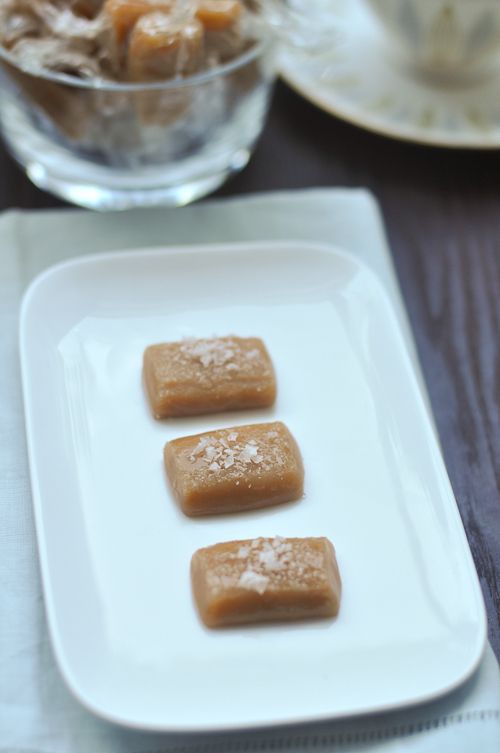 So here’s a sweet way to begin the week – below is a recipe for Rockpool’s Salted Caramels. The restaurant is famous for them and the recipe is taken from Neil Perry’s latest Cookbook, Rockpool Bar & Grill and is from pastry chef Catherine Adams. Make sure to use a digital thermometer when making these sweets, the recipe is not hard to make at all, but it’s important to be exact with the temperatures, otherwise, you could end up with caramels that don’t set, or those that are too hard. Grease a 22cm square cake tin with cooking spray and line with aluminium foil. Spray again. In a large pot, combine the sugar, glucose and cream. Stir gently and bring to a boil. Lower the heat to medium and cook gently until the mixture reaches a temperature of 113c. (It took me approximately 15 minutes to reach that heat). Using a whisk, add the butter and continue to mix until the butter has dissolved into the mixture. From here on, do not stir. Let the temperature reach 119c and remove the mixture from the heat. Stir in the vanilla paste. Pour the mixture on to the greased pan. Quickly scatter the sea salt on top of the caramel. Allow the caramel to rest and cool. This should take around 2 to 3 hours. Once the caramel has cooled, remove it from the tin, remove the foil and cut into 1.5 cm strips. Then cut each strip into 2 cm pieces. Wrap in cellophane (or baking paper) and store in an air tight container in a cool dry place for up to 5 days. Oh Trissa I remember when you gave me a whole box full of these once after one of Pash’s training sessions. They were absolutely divine! Congrats on getting them in the magazine! Congratulations on the feature…you star! Salted caramels look so more-ish! That’s ridiculously exciting that you got to guest chef for one of your favourite magazines! I hope yo get awesome feedback for it! Congratulations on being oublished in Yummy! What a neat thing to happen, especially after all the years of admiring the magazine! 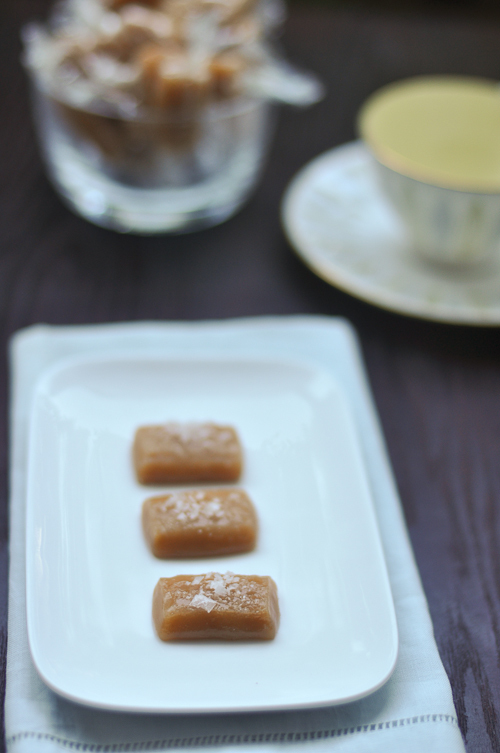 The caramels are picture perfect! Yummy! pretty! Yummy, you say…hhmmmm. Will be looking into this! Congratulations! It was interesting to read about how you got into teaching the way of the macaron. I would never have guessed that was how it went! Congratulations. I share your obession with cookery books.